Capital BrassWorks is proud to present their latest CD release, now available for purchase online: Brass Britannia! The CD offers a musical survey of English music from the renaissance to the present day, with its strong folk song origins well represented on several tracks. It’s difficult to believe that we’re already past another wonderful Festive Brass concert and that Christmas is a mere 5 days away! 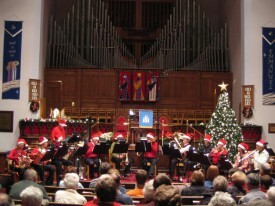 As in years past, this concert was the perfect way to usher-in the Holidays with its Christmas-inspired musical selection and carol sing-along accompanied by exceptional brass musicians. 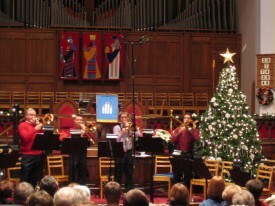 This year, the concert featured guest organist James Calkin, Capital BrassWorks’ own Elizabeth Simpson on the French Horn and the University of Ottawa Trombone Quartet. Capital BrassWorks and the Centretown Emergency Food Centre wish to thank everyone who attended and especially those who gave to our brothers and sisters in need in our city center. Together, we raised a total of $1001.95 in donations along with two cartons of food staples! Merry Christmas, Happy New Year and stay-tuned for the next concert, Dramatic Brass (March 25, 2011), which will feature the launch of Capital BrassWorks’ latest album, Brass Britannia. You won’t want to miss it! Capital BrassWorks in the Christmas Spirit! Capital BrassWorks will be recording their fourth album this Fall, under the direction of Alain Cazes, based on the repertoire from their up-coming English Music for Brass concert in Brockville. The recordings will take place at MacKay United Church, the same venue carefully selected for their first three albums. Stay tuned for the album’s release in 2011!